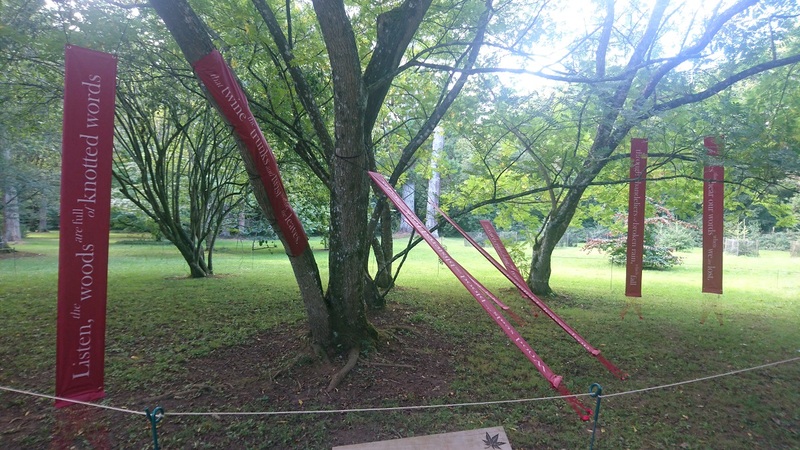 Hear This is the second poem on the Westonbirt Arboretum Autumn Trail 2017.
that twine the trunks and twist within the leaves. and burrow deep and damp, intent to hide. on trees that hear our words when we are lost. When you go to my other poems, you will see I extensively researched the trees and other poems written about them. However, for this poem, I went entirely with my feelings. In the woods, I feel trees listen to us. This poem comes from my deep belief that trees hear our words when we are lost and this comforts me. The wingnuts provided a great space to display the lines across a group of trees, not just one. “If you reveal your secrets to the wind, you should not blame the wind for revealing them to the trees” – Khalil Gibran. “When the words rustle no more … and Fire, our Sun, falls on the dark-laned meadows of the floor.” – James Elroy Flecker, Stillness. Guesstimates about the total quantity of leaves vary. Species, size, environment all play a part… it isn’t an exact science! But all estimates agree that it is a lot. In 2015 Westminster City Council alone collected over a thousand tonnes of leaves; while another rough calculation estimated that over 40 quadrillion leaves (40,000,000,000,000,000) fall in the US. A single oak may have half a million leaves. Thankfully an army of decomposers are ready to break them down; recycling nutrients back into the soil and ensuring we’re not up to our necks in fallen leaves. Of the many organisms involved, earthworms are among the most important. Aristotle called them the ‘intestines of the earth’. Our largest species (the UK has around 30 species) is the lob worm (Lumbricus terrestris), which makes deep vertical burrows from which they gather fallen leaves. As well as starting the process by breaking large leaves into smaller pieces, their faeces (or casts) enrich the soil and improve its structure. Caption: It could be argued that Darwin was more interested in earthworms than evolution! After all he studied them for over 40 years. When he published his findings in 1881 the book sold more quickly than On the Origin of Species – leading to several Punch cartoons.